I inherited my Great Grandfathers camera equipment and have no clue on what I have or if I need to add insurance on my homeowners ins. Anyone know what this is worth and no it is not for sale? Also is this equipment still usable? Anything else you can tell me about it? I have never used or seen med or large format cameras used so I am totally lost. Any help appreciated. I am guessing this is a Graflex Speed from the book that is with it? Thanks, and that is totally fine with me, I plan to put them on display in my home as soon as I can figure out how to open the Graflex and mount the lens and back to it . There is a member of my camera club who may know how and I plan to let him help me. I can only add that at on time (may still be so) there was a great market for the flash tubes on the graflex as they make great handles for light sabres, Imitation osf course. 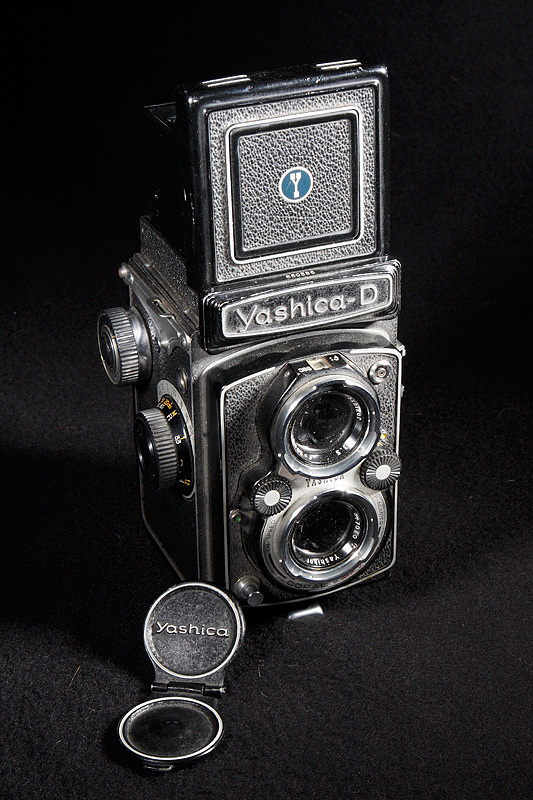 The Yashica D is still very usable, and will stun you with the fine image quality it can produce. It takes 120 film, still readily available, and will yield 12 shots per roll. The negatives are square, 56mm x 56mm, or approximately 2.25" x 2.25". However, because of their larger size, you can crop them to a rectangle if you choose, for printing. You will need a hand meter, or you can use the meter from another camera. It doesn't really have much monetary value though. Perhaps a hundred dollars or so at best. The later version, a Yashica Mat 124, can bring about twice that amount. Yashica (now Kyocera) has always produced quality cameras at reasonable prices, in my opinion. There is probably a hidden button on the top front of the Graflex. Feel around besides the viewfinder. You should be able to press down on the button and the front will open up. It's hard to tell from the picture, but it could either be a 4x5 camera, or a smaller 2 1/4 x 3 1/4 folder. Either one looks great on display. It probably still works too, as long as the bellow is good and the shutter works. 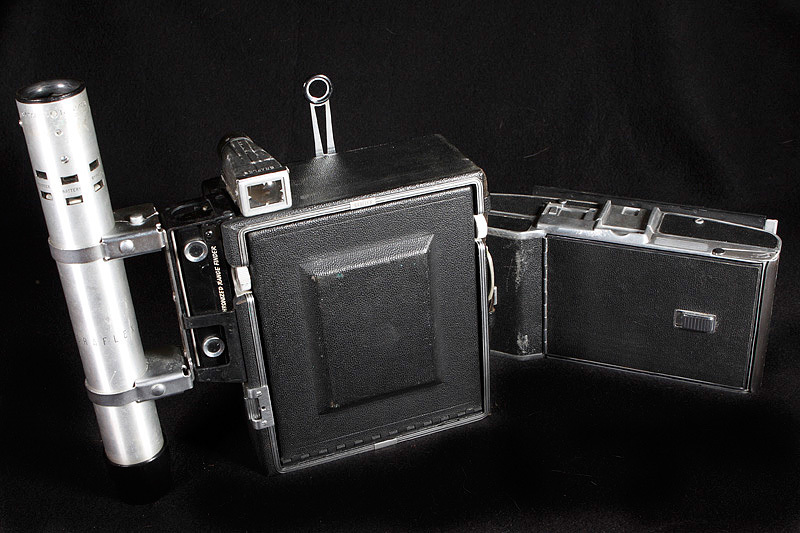 That looks like a Polaroid back next to the Graflex. The Yashica is pretty sweet, and you should run a roll of 120 through it to see what you get. 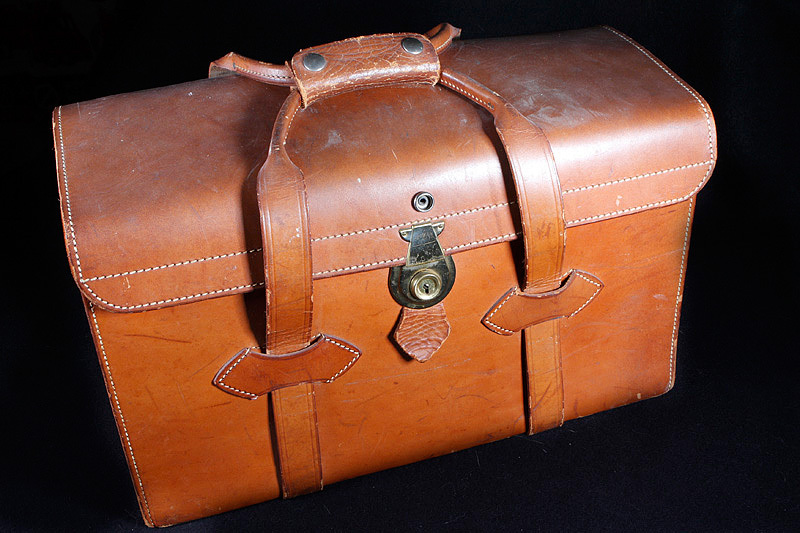 They may not have a high monetary value, but they have a high historical value, and a definite sentimental value! Edit: That's a sweet Polaroid back for the Graflex. I looked at your Pbase site. That is most likely a 4x5. "It is difficult to figure out how to open a Speed Graphic when it is closed. There is a button mounted under the leather on the right side near the top. It is visible as a bump. Depress this bump and pull the focus bed (i.e., the front, when the camera is closed) down until the bed braces lock into position." Latin Bob thanks it is a 4x5 and I will look for the hidden button. I can tell I am going to shoot with them one time if they work just to say I used the same camera my Great Grandfather did, he died when I was 5 and I am 50 now so it has high sentimental value to me. I am actually thinking I have a print from one of his old negatives of a local tourist landscape, I may try to re-shoot it from the same general area and hang it by the other one along with a digital one just as a conversation piece. Both of these were and are still great Cameras. The Images were always impressive and you will really get a kick out of using them. Just keep in mind that at this time they used everthing as Manual and kept a Light Meter around there necks at all times. Try a couple of Portraits using these Cameras and see how it affects your Minds Eye! Same Lighting Techniques, same exposures but everything that was used then is just on the Manual Side of things Technical. The Yashica D's still a great user camera; I've seen them being used around here.